Master & Dynamic is no stranger to making unique headphones, but the new MW07 earbuds are the first time it’s dabbled in truly wireless earbuds. These AirPod competitors cost $299 starting today, last 3.5 hours on a charge, and can recharge from their case to reach a total of 14 hours. Like any consumer hardware company, Master & Dynamic has had some design missteps but the MW07s are a step in a different direction: luxury materials meet portability. The MW07s use handcrafted acetate covers — just like a pair of pricey sunglasses — to give each earbud a completely unique pattern. At launch, Master & Dynamic will offer the MW07s in tortoiseshell, steel blue, grey terrazzo, and matte black acetate finishes. 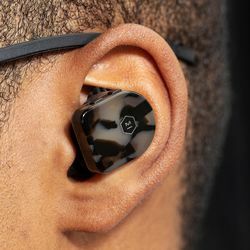 PVD-coated stainless steel houses the rest of the internals, including 10mm beryllium drivers for producing sound delivered by Bluetooth 4.2 radios. My review for the MW07s is coming soon, but I can speak to some of my first impressions. They look like they’re bulky and large in photos, but they actually fit snugly and are lightweight when you’re wearing them. 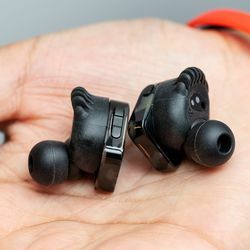 The audio quality is definitely some of the best I’ve heard in truly wireless earbuds — better than the AirPods — and the “fit wings” isolate you from outside noise enough to make you think you’re wearing actual over-ear headphones. The MW07 earbuds don’t have active noise cancellation, but they are much better at blocking outside noise compared to the AirPods. 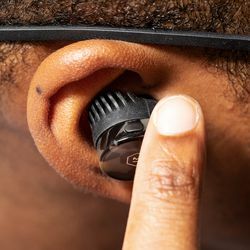 There’s also a button on the right earbud that will launch the native voice assistant for your phone: Google Assistant on an Android, Siri on an iPhone, or even Bixby on a Samsung device. Removing either earbud while music is playing will pause the track, and placing it back in your ear will resume playback. 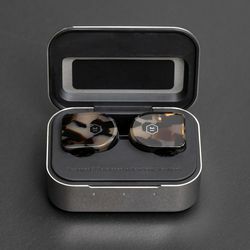 Master & Dynamic also included quick pairing, so opening the case and picking up an earbud will resume the Bluetooth connection with the last paired device. 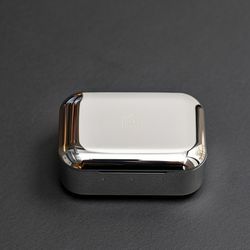 The MW07s come with a shiny, polished metal charging case that’s considerably larger than the AirPods’ charging case, but it still fits in a pocket without issue. It charges over USB-C to 50 percent in just 15 minutes, and it takes 90 minutes to fully charge the earbuds when they are inside of it. The MW07s are promising, but the real-world battery life and wireless connectivity — two of the most important things for truly wireless earbuds — will take a little longer to test before arriving at a verdict. But so far, Master & Dynamic’s pricey MW07 earbuds show promise.